Every garden season is a chance to try new things. That’s part of the excitement in spring. What unusual plants or different ideas we will explore in the garden of 2019? Well, how about edible flowers? We’ve all seen flowers as garnishes, that’s been trendy for years, but they aren’t just decorative, they are edible. They can be deep fried, added to sandwiches and pastries, sugar coated for delicacies, used as decoration on cakes, or tossed in salads for color. The value of most flowers is akin to herbs—they are medicinal and frequently used in teas, and ointments but they also pack a nutritional punch and don’t require much space in the garden. Here are five easy-to-grow and easy-to-cook-with flowers. Try them, or if you already use flowers in your repertoire of recipes, please share a recipe or a favorite cooking flower in the comment section below. As with all things, take precautions prior to eating flowers and know which ones are and which ones are not edible. Not all flowers are edible and some can make you very sick. Follow the common sense rule: Ask first before you pop it in your mouth. Here are five flowers that are easy to grow and tasty. A cool season flower that is very easy to grow from seed or transplant. Although, because they are cool season, starting with transplants saves time in the shorter growing season. Flats of pansies in 2” starter pots are readily available. Pansies need full sun and are planted in early spring or fall. They wither in the summer heat. They can withstand a frost or freeze, and don’t mind a little bit of snow. Grow them in containers, annual beds or as groundcovers. Fertilize every 7-10 days for optimal bloom. Water weekly and consistently. Lack of water is the number one reason most pansies do not thrive. Pansies are a favorite for cake decorating, tossed with salads, sugar coated, and added to soups. 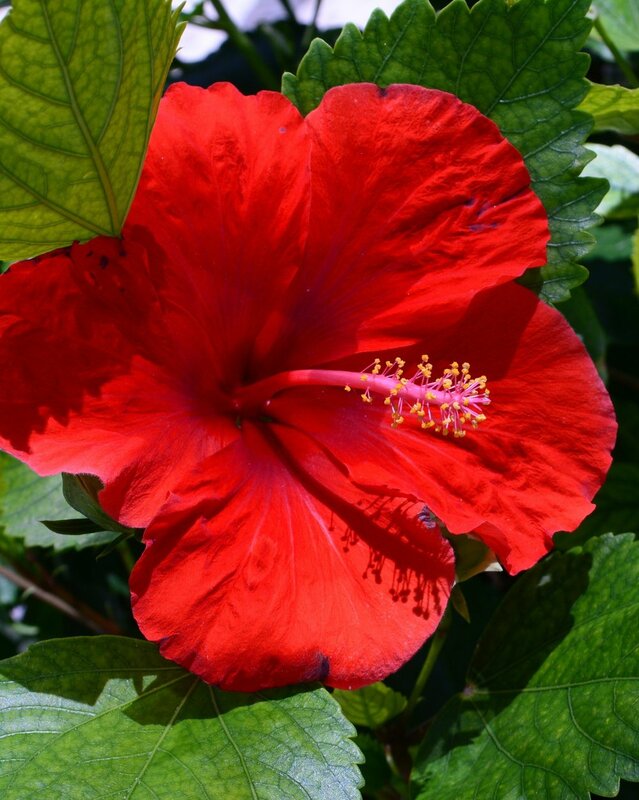 HIbiscus sabdariffa or Roselle is a sun-loving shrub that is grown perennially in zones 8-11. For Western North Carolina, it is an annual that is easily grown from seed or transplant. Part of the mallow family, it’s growth habit resembles okra. Due to an influx of hybrid hibiscus, stick with Roselle when growing hibiscus as an edible flower. It is the most common edible one, using the calyxes, leaves and flowers in recipes from teas to jams. This shrub loves sunlight, and consistent water. It can reach 6’-8’ tall so give it lots of room. Place in an area that doesn’t get a lot of wind as its branches snap easily. It flowers beginning in July and will continue through early fall. It’s most popular use is for hisbiscus tea which is rich in vitamin C.
Many of us have grown squash but did you know their flowers are edible too?Both summer and winter squash have edible flowers and both the male and female flowers can be eaten. This truly is the plant that keeps on giving. When harvesting the flowers be sure to leave enough of the female flowers to have fruit. Look closely before picking and you should see a small squash forming under the female flowers. Squash plants are easy to grow from seed or transplants. Full sun and consistent water is needed, but the plants do not want to be wet. It’s best to mound the plants, 12”-18” above soil line for better drainage and air circulation for vines. Squash blossoms are great fried, stuffed with cheese and baked, added to pasta dishes and quesadillas. An annual in Western North Carolina, this flower grows as a vine or small, bushy shrub. It is quick growing from seed, but transplants are available. It is a full sun plant but can tolerate afternoon shade which it prefers in hotter areas. Very easy to grow, they thrive on neglect. Do not fertilize as they don’t need overly rich soil, which produces more leaves than flowers. Consistent moisture but not damp is best. One of the most popular edible flowers, it is packed with vitamins A,C, and D. The flowers have a peppery taste that adds zing to salads, stir-fries, pastas, soups and even wine. The leaves are edible as well. Wild primroses are yellow and signal a new season of food and warmth as they are the first flower of spring. The wild primrose is a popular food to forage and use as an edible flower, although all colors of primrose are edible. These flowers are best from transplants. They are low-growing, dense perennials with rough leaves that like full sun to light shade. Plant in a spot that gets full sun in early spring but shade in summer—they don’t like the heat. The flowers are used in cake or pie decorating, coating them with sugar and baking them first. Written by Cinthia Milner, garden coach and blog writer. B.B.Barns Garden Center serves all of Western North Carolina, upstate South Carolina and Tennessee.